It's time to buy clues. There's an odd thing about the coverage of the Iraq war. If you want to see how dangerous it is, you need to watch shows like War Diaries, Shootout and National Geographic explorer. Bush and many people in the US like to depict the Iraqi guerrillas as barely competent. But on these shows, the soldiers are lucky to survive their encounters. They routinely trap US troops. Only the superior training of US troops prevents disaster. We have mostly hidden the absolute Mad Max like danger from the American public and relegated it to buff TV on cable. Yet, if you watch these shows, the unremitting violence, the near anarchy of it becomes clear. The Iraqis can certainly take on Americans and walk away. Notice the lack of Iraqi government support. The executions of US soldiers in Karbala and merceneries in Baghdad. Those are not accidents. We're sitting around listening to Dave Petraeus brag about his new manual on counterinsurgency as if the Iraqis don't know it page by page. You think JAM and the Sunni guerrillas are idiots? Unable to read and translate English? You don't think the Iraqis aren't also surveying the new De Lattre Line posts our genius general has now decided, despite all evidence of failure in the past in other colonial wars. The debate in Washington is taking place in a vacuum where we act as if the decisions are ours. Let's examine some realities our genius generals have not. You cannot have private armies and then expect the other warlords to disarm. Isn't going to happen. Bush keeps relying on the Iraqi "government" as some sort of anchor. There is no Iraqi government and the promises that we get are just that. Promises. It is comical to watch Petraeus talk about he's going to convince people to turn away from their effective protectors and embrace the incompetent ones because it would end violence. Well, when Iraqis talk of ending violence, they mean kill the other guy. 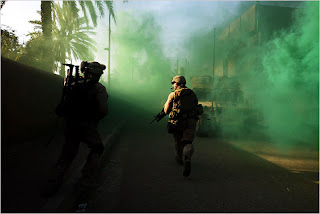 The fact is that the US cannot trust the Iraqi Army to not frag them or set them up for an attack. Odierno and Petraeus will soon be at each other's throats, because they will quickly disagree on who to attack. Besides the fact that Odierno is a dunderhead, his penchant for going after Sunnis will soon conflict with the need to go after Shia. Now, think about this for a minute. US units are to take on all militias at some point. How is this going to work? The Shia are supposed to wait for the US to come into Sadr City? I doubt it. If we attack the Sunni, it is in Shia's interest to attack US forces. Why? Because they can't fight two enemies at once. Oh, they can try, but it won't end well. We're debating a "surge" as if the Iraqis are monkey men who live in deep jungle. We're debating tactics and they can adjust to them because they read the NY Times. Doesn't it occur to anyone who thinks that the Iraqis will be able to neutralize the "surge" which is really a slow gathering of US Brigades, and which rely on Iraqi help. As if they won't be working their magic, making it clear that helping the Americans might be unwise. This "surge" which should be called a dribble, is the worst kind of military movement, slowly massing forces over a six month period. Does the Army think they will be waiting for all the brigades to arrive? We can't even trust the Iraqi translators. American Arabic speaking soldiers find that they say something which is far from what was supposed to be said. The whole discussion of the "surge" has been one of the most idiotic military plans ever proposed by a major power. If we are serious about "taking Baghdad", why is the general in charge discussing the plans? What? Does he think a few AC-130's will save the day? The Sadrist movement is a movement which goes beyond JAM and Sadr. You cannot buy the loyalty of the poor Shia. You cannot give them fake policing. Even to assume they will help you is foolish. They want the right to run Iraq and no compromise is going to be on the table. Hell, the Maliki government tried to coopt us into a genocidal clearing of Sunni neighborhoods. But in the end, it doesn't matter if the surge happens. It won't change anything but who dies in Iraq. However, this has placed the Bush administration on very dangerous ground in the US. By ignorng the Iraq Study Group, he has made it clear that the Republican Party is on it's own. The impeachment drumbeat has been in the background since last summer. It's a popular idea outside the beltway. The Republicans voting for resolutions today are the Republicans who will demand Bush resign by the end of summer. As the surge fails and Bush has no answers, the establishment will demand something be done. Bush and Cheney act as if they have unlimited power. They do not. His polling numbers are under 30 percent and won't be going higher. The public wants the war to end. Bush acts as if he can continue like this for two years. I doubt he can do this for six months. All the Sadrists have to do is spring one massive ambush and his Iraq policy will collapse. What will Dave Petraeus say when one of his little De Lattre forts are overrun and 30 dead Americans are left while the Iraqis disappear?